For the elderly or those with mobility issues, such as wheel chair users, getting onto and off the toilet can sometimes be a bit of a difficultly. However, there are some great bathroom aids which can help with thins and make sure that you don’t need to get a family member or carer to help you onto the toilet every time you need to go. You can retain your independence and get some relief with a good toilet seat extender or an elevated toilet seat. This simply bring the seat up to a higher and more comfortable level, and they often have grab bars and handles to make the transition easier and give extra support. Here at Apex Health and Care, we’ve got a great range of things to help with mobility in the bathroom, and these toilet seat extenders are among some of our best selling items. If you or someone in your family needs a bit of extra help in the bathroom, please check out what we’ve got on offer. We have products of all different sizes and designs, so we’re sure that there’s something perfectly suited to you just waiting to be found. All of the products we list are of the highest quality and have been checked against current safety regulations and standards, so you can buy from us in confidence. Here are a few things to bear in mind when trying to find the best toilet seat accessory for you and your family. Handles – Some of these seats comes with handles, some don’t. These handles and bars are great to give extra help and grip, and rare especially good for disabled users. However if you don’t need them, there’s no point in paying extra for them. Clamps – You’ll want to make sure that your raised seat has some kind of clamp or mechanism to lock down on your toilet and hold it securely there. The last thing you want is to have the extended seat slip of while you are on the throne. This would not only be very embarrassing, but it could be very dangerous ans you could fall and smack your head on the floor, the toilet or the sink. Free standing or not – Some of these seat extenders come as free standing accessories, meaning that they have legs, just like a chair, which will hold the seat in place on the ground. These are very secure, but the take up a lot of room, both in the bathroom and when the seat is in storage, so again, we don’t recommend you get on like this unless you really need it. Cleaning – As it is going on the toilet, you’ll want something hygienic and easy to clean, Ideally, you should be able to wipe it down, and it should be able to stand disinfectants as well as normal cleaning fluids. This great toilet seat is ideal for disabled and elderly users who need an extension to the seat and a little bit of help from the handles in getting on it. It will install easily under your toilet seat, and the arms are detachable in case you’d rather not have them or other users want to remove them. Instructions for this are included. The elongated bowl approximately 19.5 inch long and 14 inch wide and 3.5 inch tall, so please check these measurements to see if it will work with your bathroom. This also wipes down easy, so you can be sure that it is a nice hygienic and easy to clean. Add an extra bit of height to your toilet and make it easier to use with this great seat riser. With 3.5 inches of extra height, this hinged seat extender will be great for the elderly, those with limited mobility, or those recovering from knee, hip or back surgery, as it makes it easier to sit or stand on the seat without completely bending. This comes with all the screws you need included, and it has a very simple and tool free assembly and installation. 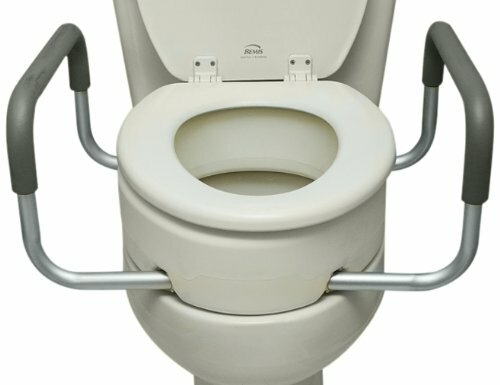 The toilet seat riser securely attaches and the screws eliminate slipping, making it both safe and comfortable to use. 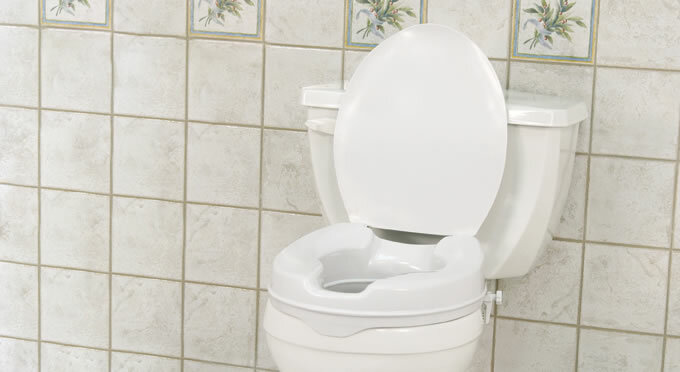 What really makes this special is its hinged design, which lets you lift it up like a regular toilet seat, so others can lift it up and use the toilet as normal. Hygiene will also not be an issue, as this can easily be cleaned and wiped down with regular household disinfectants or sanitizing wipes. If you don’t need a seat with handles, this might the the perfect one for you and your family. 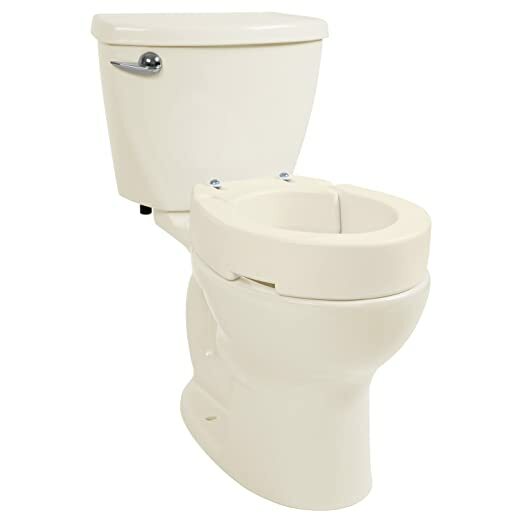 With a unique and innovative look, this extended toilet seat has a wide and comfortable ergonomic design adds width and will add 5″ of height to your toilet seat in order to help you and members of your family get on and off the seat with ease. Anyone with mobility issues or problems bending or sitting ill feel much more at home on the throne with this. 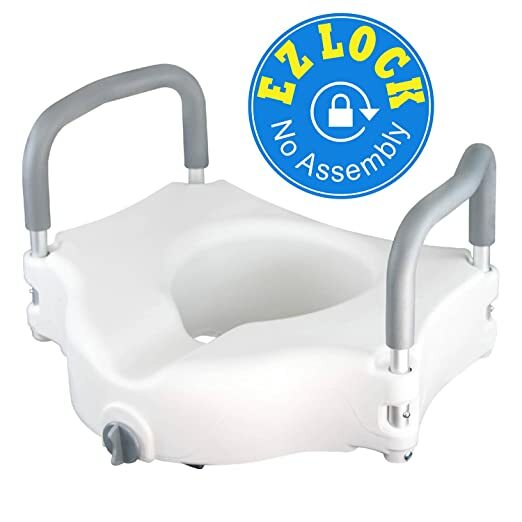 The last thing you want is for this seat to slip or the toilet, so it has been built with an anti-slip feature and locking mechanism, which makes sure that it will have a secure fit on the toilet bowl. For added comfort, there are removable padded handles and seamless edge, so that your siting experience is always a pleasant one. 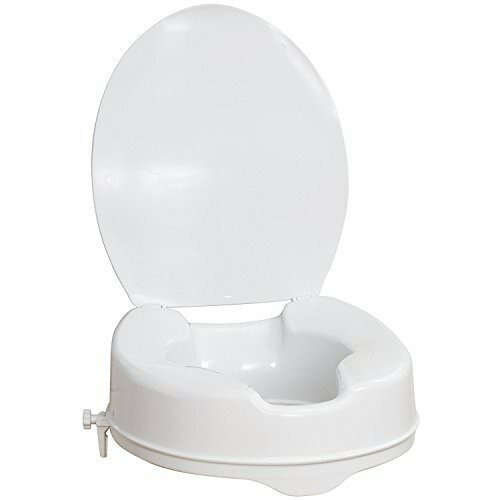 Also, as it is constructed from high quality, anti-bacterial heavy-duty molded plastic, this is both durable and hygienic. It will work best for individuals below 250lbs and height below 5ft 10. You don’t need tools to install it, and its most standard toilets (16.5″) and elongated toilets (18.5″).